Co. reg. number: 593581, Ireland. Price: €875.00 VAT included. Shipping not included. Mahogany. Rosewood Finger Board and Peghead. Schaller Geared Tuners. Harp & Dot Inlay. Standard Scale 19 fret. 23 inches/585mm. Short Scale 17 fret. 21 inches/525mm. Standard Neck Width at Nut - 30mm. Clareen Banjos manufactures it's own Tone Rings and Tension Bands. All other Metalware is manufactured in Ireland where possible. The neck is fitted with Carbon Fibre Truss Rod for added strength. The Clarenbridge is available in Tenor and 5-String. Open-Back option also available. All metal parts are of brass which have been nickel plated. The hooks are of mild steel which is also nickel plated. Suitable for all tuning styles. Excellent tailpiece. I would compare this as a price frossed with a presto. It is solid and adjustable and looks great. Fully adjustable and sounds excellent on my gibson mastertone 5 string. Love this banjo. My husband surprised me and purchased this past August and I love it. Sound is clear and crisp, easy to play and Tom and Fintan were a joy to work with. Tom spent a lot of time with us explaining things and showing me different things on the banjo and it really made a difference. 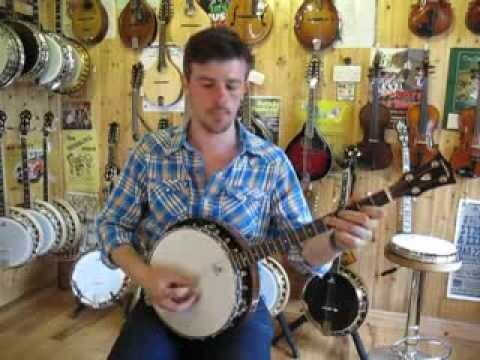 Playing this banjo has actually made it easier for me to play my 5 string banjo. I hope to visit them again next summer when we go home. Copyright © 2019 Clareen Banjos. All rights reserved.